Eye-catching 15.1 hand Country English / Show Hack / Costume Arabian mare with a pretty head with a large eye, great hip and shoulder, clean legs and natural, fluid movement. She has two regional credits to her name plus many class A Championships and wins. She is also an outstanding broodmare with impeccable bloodlines. She has produced 2 beautiful, top-quality foals for us — Miss Afire Burnin and Everybdy Luvs Raymond. She has proven to produce better than herself which is always a quality we look for in a broodmare. Plus MANY Class A Championships and Wins in Country English Pleasure (Open and AOTR), Show Hack and Costume. 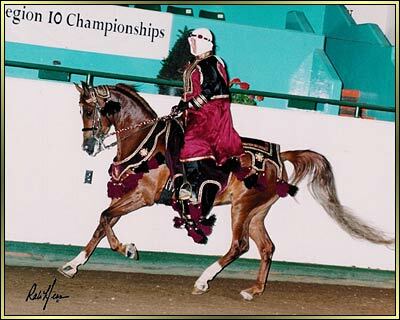 Miss Afire Burnin: Purebred 2000 Bay Mare by Afire Bey V. Making her debut in performance in 2004. 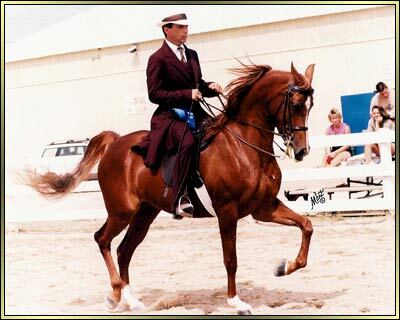 Everybdy Luvs Raymond: Half-Arabian 2003 bay gelding by Majesteit (Dutch Harness Horse/Tuigpaard Sire). See him on the Foals page.